As illustrators of the radical history of British Columbia and Canada, union representation just seemed like a natural step for members of the collective. “We do a lot of thinking about the role of labour and workers. We wanted to make sure that what we do and what we say align,” said Sam Bradd, GHC graphic facilitator, illustrator and founding member. The collective originally came together to create “May Day: A Graphic History of Protest in Canada”, now in its 3rd edition. In 2016, they’ll be releasing “Drawn to Change: Graphic Histories of Working Class Struggle.” The Collective is currently working on a comic tentatively titled “Direct Action Gets the Goods: A Graphic History of the Strike as Political Protest.” These comics are replete with British Columbian history. “May Day” includes the Big Strike (1912-1914) and the annual bean supper in Cumberland on Vancouver Island. Many of the comics in “Drawn to Change” focus on BC’s rich working class history, including one on the Corbin Miners’ Strike, the Battle of Ballantyne Pier, and the socialist feminist union, SORWUC. The BC Government Employees’ Union has even provided start-up funding support for “Direct Action Gets the Goods”. O’Keefe explains that during Unifor’s formation, a critical discussion took place around the importance of organizing as well as representing workers outside of traditional workplaces.This is where the formation of community chapters came in. In highlighting some of the challenges facing independent media workers, and working to overcome them, the union dispels the myth of freelancers being a creative class that is immune to exploitation by employers and the precarious nature of this type of work. “We’re cultural producers but we’re also helping people who might think of themselves as freelancers and contractors realize that, at the core, they’re still workers,” said Bradd. By being deemed independent contractors, freelancers have lost when it comes to wages, secure benefits, and basic employment standard protections. Employers are able to use the concept of “labour of love” to squeeze more unpaid work out of them. Independent media workers are certainly workers firmly connected to the struggles of the labour movement. Some, though, might raise questions about the effectiveness of CFU, and the community chapter in general. Because it’s not a union and falls outside the jurisdiction of labour relations legislation, the CFU does not engage in collective bargaining and cannot enforce contracts in the same manner as a traditional labour organization. It is also argued that the CFU, like the Freelancers Union in the States, treats “workers as consumers for services they provide” with an emphasis on benefit plans rather than engaging in labour struggles. Despite these shortcomings, the inclusion of freelancers into the union movement, alt-labour or not, is promising. The recognition of their relationship to other workers has not only inspired the GHC to create labour and working class histories, but to create an internal model reflecting this understanding. “One of the comics about Filipino workers in Ontario was a community-based research project,” said Bradd. “It’s not only about the subject of the work – labour – but about how the work gets done.” Perhaps one day a graphic history will be constructed about the development of these innovative, and important, freelance unions. Article republished with permission. View the original at rankandfile.ca here. 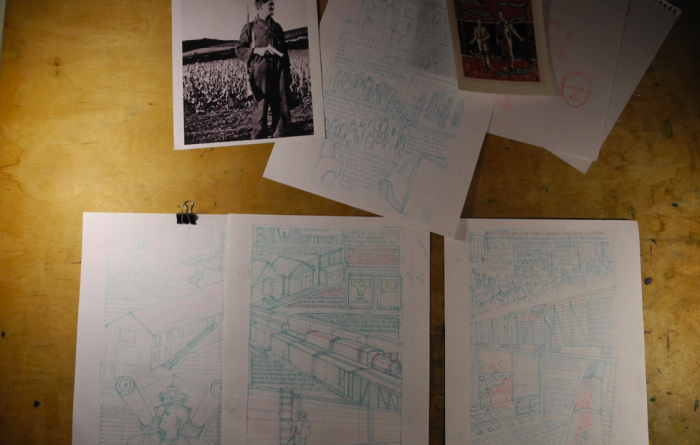 Image credit: Scene from the making of Drawn to Change: Graphic Histories of Working-Class Struggle. Illustrated by Kara Sievewright.